Garden #1 was a rocky succulanty sort of thing. The landscape and interior designers are Gino Dreese and Tony Williams of Mojave Rock Ranch. They focus on gardens that don't use much natural resources. Like water. Obviously. A brilliant pop of color. I just read somewhere that "pop of color" is an over-used design term. Whatever. Obligatory Palm Springs pool feature. You honestly could not survive a summer without a swimming pool. You simply could not. Metal fence was pretty cool. Seriously? A garden tour with no pictures allowed. You are killing me guys. And it wasn't really super fabulous. Maybe that was why no pictures. I took this photo of a green tree we kept seeing everywhere immediately outside the garden wall. If you know what it is, please put in the comments. I would like to try and grow one. Very sculptural. Another over-used design word. This was hands down my favorite. Very Asian influenced. I am sure the landscaper's name is Weyant. And while Googling this garden I found this fun post about the garden tour from Pasmpas2Palms, a British horticulturist. He notes that the tour was a little understaffed and the schedule caused some unusual backups of people waiting to get behind garden gates. I won't go on about it. Much. Well, I just did, a little. This garden uses circular concrete pavers everywhere. I loved them. My British friend thought that this garden could do with more plantings. He clearly hasn't met me. The less plants, the better I like it. I paid attention to how every little thing was placed in this garden. Note how the twin statues line up with the right side of the fire pit perfectly. I would have loved to see the fire feature on. It greats you as you walk through the front gate. This garden was staged in a really lovely manner. The owner clearly went to a great deal of trouble to make it look perfect. You couldn't take a bad picture. This pool just screams Palm Springs. Love it. These boulders appear to be part of the concrete patio or set nearly in it. The sand was raked just so around the boulders. VERY zen. Much better then annoying plants which need to be watered and die anyway. Great mid-century outdoor light. I kind of want that. Landscape architect put in a circular drive way which I found just so impressively cool. Garden #4 Just the gate. Really. An entire page in a brochure for a gate. Here it is. This was Mom's favorite garden by far. She liked all the flowers and the way it smelled. Kind of sweet. The owners have done so much work to create quite a little oasis. The garden was designed to attract birds and even has a few turtle ponds. Which somehow I neglected to photograph. Tour burnout perhaps? I liked these trees. They are called Tamarisks and were planted as wind breaks when Marjorie Main (aka Ma Kettle, I know who?) built the house in 1931. This is a pool house or guest house. Unusual bottles in the wall detail. Drink much? Or "Ode to Beverages." Either way I like. Here is the front of the property. Absolutely charming. Not very mid-century modern but we'll give it a hall pass due to the lovely garden. Yes more garden tour restrictions. Only look at the front yard. There seemed to be a party in the backyard. The party goers would yell at the garden tourists when we peered through the backyard gate. Enough whining. This garden was pretty rustic. Lots of broken pots and hearty "rubble" benches. My British friend took this exact same photo. Everyone did. Nice use of wrought iron on the wall. We did the same with a piece we pulled down. Someday I will show you our bizarre little courtyard that I want to redo. Of course. I liked this crazy pot cluster (you can complete that phrase yourself). All in all, an inviting garden gate and wall. So cool. 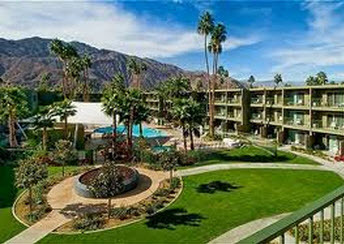 The Saguaro is a creatively renovated Holiday Inn. I like the quote from the brochure. This is a very successful example of adaptive reuse of a mundane building into the visually exciting hospitality experience it has become. I found a small picture of the "before" online. Unbelieveable. We had the good fortune to speak to the Landscape architect, William Kopelk, who is also the Chair of PS Modernism Week (or has been in the past). Just suffice it to say he is pretty important in Palm Springs. Bill (can we call you Bill? ), did a fantastic job with the landscaping of this colorful hotel. He shared with us that it was painted in 14 different colors. William choose four colors to emphasize in the landscaping: orange, purple, green and yellow (I think). It was William's idea to create these metallic sculptures which emulate the mountain range that you can see behind the hotel. Smarty. Just so colorful. And refreshing. We had another nice reception to end the tour. I did not set this picture up. It was laying there waiting for me to photograph it. I still have some more posts left in me. I have a special treat I have been saving for the end. I'll get it up on Friday for sure. This is so inspiring! Makes me want to get outside and work in my yard. Sometimes I really wish I lived in the desert. All of those cacti and beautifully placed rocks would be a dream come true... but NOT in Texas. We have to deal with so many leaves from neighbors trees that I'd be constantly picking them out of everything. They'd get stuck between every rock and every needle. ( sigh! ) It is lovely to look at and dream. So stupid that they put restrictions on photos, etc. Hey... if you're going to open your house to the world JUST GO FOR IT! Otherwise don't do it. (I'm just sayin') Great post. Can't wait for the next one. Yea, I hate to complain when people are opening their houses. It was after I read the post from pampas2palms.com that I realized there were some oddities about this garden tour compared to others I have been on. And yes, I really don't think you should have people traipse around your yard if you are not comfortable. Not a good idea. Loved this post. Love that typical Palm Springs pool. I can picture many very FAB parties around that one...and the horizontal wooden fencing I want around my yard! Wouldn't it be great if we could swing that desert modernism landscaping in CA? It's so beautiful, and so simple. Thanks, I love a good yard tour! I am sure trying to replicate some of these things, but seeing the tour yards gave me more ideas. I went back and looked at the wood fence you referenced. It is beautiful! Succulants and cacti are perfect foils for the spareness of Mid-Century Modern architecture. My only caveat is that those beautifully arranged plantings grow and spread, eventually requiring replacements, but I guess no landscaping design is perfect. You are right. Even our newly planted back bathroom garden is getting bushy after only 6 months. Darn things grow. I would love to go on a garden tour like this! Number 3 of the gardens is def my favourite too. Love the circular stepping stones. I also like the 'pop of colour' (I like to swim against the tide...) in the first garden. Hello Donna. I did like this tour a lot in spite of almost low hopes because I knew it would be desert. We were surprised. I loved those circular pavers and am giving them some serious thought. The hotel looked really cool and worth touristing too if you ever get the itch. Hope all is well in Australia! #2 green tree - looks like a 'Desert Museum' Palo Verde / Parkinsonia x 'Desert Museum', or some other Parkinsonia or palo verde. That one seems good in So Cal, and I've seen some used there in designs. Seen it bloom - amazing. Shoestring Acacia does something like that, but the blooms are not as good. Thank you so much! I really want to try one. We live near the ocean so may be not hot enough for it but I will look it up.